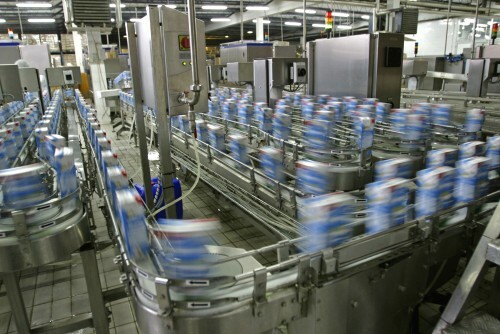 The Overall Equipment Efficiency System (OEE) was developed for a leading FMCG company to solve problems of inefficiency on their production line. As with any production line, numerous machines work on their own stage of the production process, and these machines need to be monitored closely. Most of the time, these machines work together, keeping pace with each other and producing as they should. Factory workers are normally able to monitor and support the machines in their production. However, in cases where a machine malfunctions, it is not necessarily known to machine operators and certainly not known by the other machines. This lack of communication creates a serious problem, as machines and their operators will continue working unaware of the malfunction, potentially blocking up production and dramatically reducing efficiency, productivity, and ultimately, profit. The OEE system creates communication between the many machines on a line. This communication eliminates production bottlenecks and has been shown to boost line productivity by approximately 35%. In addition to automated notifications and production line shutdowns, the OEE software monitors a machine's inner workings, providing notifications for preventative maintenance and upkeep. This will then work to the benefit of the client in the future, as factory operators will have the necessary information to repair potential problems before they occur and not during production times. This data is made known to the operators, but it is also communicated directly to management, giving complete visibility to the factory floor. Regular updates and reports can be sent automatically to anyone, even to the desk of the CEO. ZI-ARGUS is at the forefront of technological development as it pertains to problem-solving for businesses. Contact us for more information on how we can serve and expand your organization.